Are you a G.I.R.L. (Go-getter, Innovator, Risk-taker, Leader)™? Of course you are! Girl Scouts empowers girls to be courageous, try new things, take charge, AND change the world. And here in western Ohio we’re highlighting some of our very own G.I.R.L. (Go-getter, Innovator, Risk-taker, Leader)™ superstars as we countdown to G.I.R.L. 2017 next fall in Columbus, OH! Our top cookie seller this year sets goals and rises above challenges like a true cookie boss! Jojo was born with pediatric gastrointestinal conditions and pancreatic rest, and she also lives with juvenile idiopathic arthritis (JIA). Because of this, she is home schooled and spends much of her time in the hospital undergoing testing. Determined not to let anything stop her from reaching her goals, this intrepid 10-year-old pounded the pavement and went door to door throughout her community and beyond. Her hard work paid awesome dividends as she sold over 2,800 boxes during the sale! After she hit her goal, Jojo proved she’s a sister to every Girl Scout by helping other girls to increase their sales numbers, including her shy cousin who joined Girl Scouts in February because of all of the fun she saw Jojo having! Through the Cookie Program, Jojo says she’s learned math and how to give change back to people. She’s learned how to talk to people and be polite (even when they might not be). She also loves all of the science programs and camps that she can participate in with Girl Scouts. She plans to be a Paleontologist one day. You are our go-getter cookie boss, Jojo! Who are Chicks With Bricks? They’re members of our northern region’s Girl Scout FIRST LEGO League (FLL) team! Ranging in age from 8 to 12 years old and brought together by a shared love of LEGOs, these girls competed in scrimmages called “coopertitions” and ranked high enough in their first year to go to state! This year’s theme was Animal Allies, and after researching and meeting with bee keepers, the girls designed and built a 2-in-1 tool that bee keepers can use to keep hives (and bees) healthy. The girls are submitting their new tool, called the Propolis Punch, for a patent. Now that’s innovation! Are you an innovator aged 8 to 12 who loves LEGOs? Want to join a Girl Scout FLL team? Check with the program and partnerships staff in your region this summer for information about new teams forming in fall across western Ohio. If adventure is calling, senior Girl Scout Troop 20062 (otherwise known as Troop Mud Puddle) is answering! 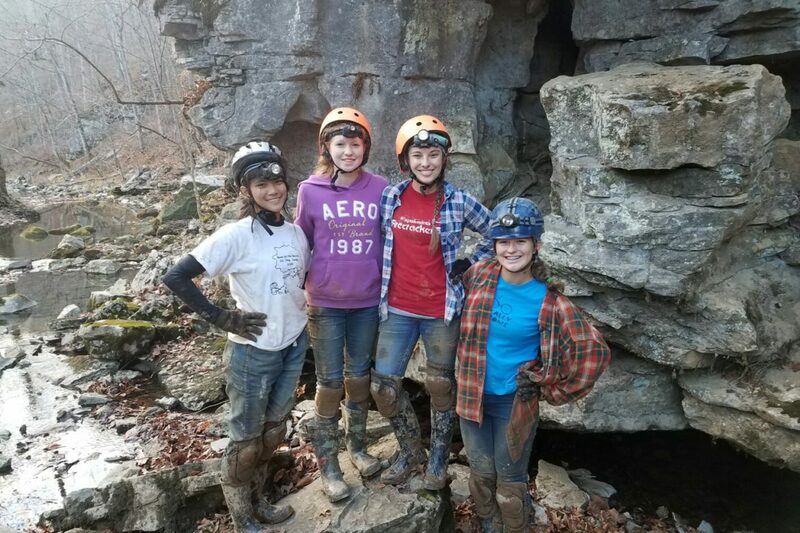 Last fall, these girls confronted common fears of the dark and cramped spaces head on with an underground spelunking adventure at Sinks of the Roundstone and Arthur Singletons Caves in Kentucky. While there, they mastered basic caving skills taught by their hosts from the Central Ohio Grotto and earned a council’s own caving badge. We learned a lot about the caves and their history, including the different rock formations and wildlife within the caves. We had a wonderful experience and plan to go back in the spring for another caving experience! Girls of Troop 20062, we tip our helmets to you and those like you, our cave explorers and risk-takers! Alex honed her leadership skills as she promoted healthy lifestyles through yoga for her Gold Award project! She founded the Centerville High School Yoga Club and worked with athletes to promote yoga as an injury prevention measure. Plus, she worked with children in the foster care system to share how yoga can help with stress management! The Yoga Club she began is a permanent program at Centerville High School. Seeking more opportunities to both grow as a leader and help others, Alex applied and was chosen to represent the girls of western Ohio on our Board of Directors. This special opportunity gave Alex the opportunity to take the lead and make an impact on Girl Scout policies, decisions, and opportunities in the future! To all of our G.I.R.L.s (Go-getters, Innovators, Risk-takers, Leaders)™ across western Ohio who are taking charge and changing the world, you are our G.I.R.L. superstars! So are you a go-getter, innnovator, risk-taker, or leader? What about all of the above? We know you are! Join other superstars like you this fall in Columbus at G.I.R.L. 2017 or check out our council activities and summer camps for more fun adventures and events across western Ohio. Girl Scouts, we cannot wait to see what other awesome ways you embody G.I.R.L. as you reach for goals, innovate, take risks, and take the lead to make our world a better place. You go, girls!